BatSnap Kit product page, where you can buy BatSnap kits. Make sure your camera is set to take a picture using an IR remote. 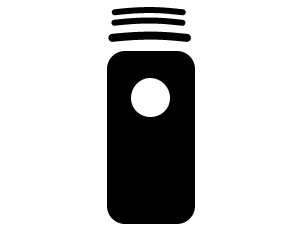 It's usually a little icon like the one below - refer to the camera instructions if you're not sure. Turn the BatSnap on by moving the slider switch towards the IR LED. The red LED should blink twice to let you know it's alive. Press the push button on the top of the BatSnap while pointing it at your camera. Make sure it's pointing at the camera's IR receiver. Turn the BatSnap on while pressing the button. The BatSnap starts timing your interval - it will flash quickly to show you that it's counting. When you next press the button it sets the interval and starts sending IR pulses at that interval. For example: To set the BatSnap taking a picture every 20 seconds... turn the BatSnap on with the button held down. Twenty seconds later, press the button again. The BatSnap will then keep sending an IR signal every twenty seconds, until you turn it off. Once you've set the interval, if you press the button again it will simply send an additional IR signal at that moment. It won't affect the running interval. If your interval lasts longer than ten seconds, the indicator LED blinks a countdown to allow you to more closely anticipate when the picture is taken. The BatSnap works consistently to at least 8 metres in normal lighting conditions (it's been tested outside during night and day; inside in daylight and under halogen, incandescent, fluorescent and LED lighting). With careful aiming you may be able to operate the camera from even further away. In very bright conditions the range may be reduced. If the battery is running low the range may be reduced. 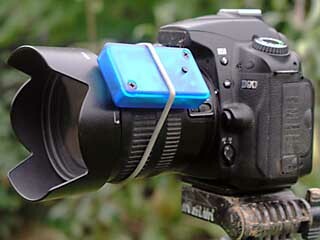 When taking time-lapse photos, we find it useful to attach the BatSnap to the barrel of the lens with a rubber band. The BatSnap is very lightweight, so shouldn't interfere with the camera's operation, and allows the BatSnap to remain very close to the sensor for highly reliable operation. These are details of the cameras we believe the BatSnap should work with. It may be possible to add more to the list over time. Please let us know if you find any cameras that work and aren't on this list! Years, if left switched on and not sending an IR signal. It's quiescent current is around a microamp, so it should outlast the shelf-life of the battery. In use, it will take more than 300,000 shots from one battery. After that you'll find that the range reduces so that by 500,000 shots the remote control needs to be aimed more carefully, but can still be used from 4 or 5 metres away. However, be careful not to store the unit switched on, with the button pressed. This will drain the battery in around four days. Red LED doesn't light on switch on, or button press. Check it is switched on. On is with the switch towards the IR LED. Check the battery is inserted the right way round. + side up, - side down on the board. Check soldering and component orientation. The LEDs, the capacitor and the chip need to be soldered the right way round. Red LED lights, but camera doesn't take a picture at all. Make sure the camera is set to 'remote' mode. Read the camera instructions. Make sure the BatSnap is pointed at the camera's IR receiver. It's usually a small dark 'window' somewhere on the case. Read the camera instructions. Check soldering and orientation of the IR LED. Try moving the BatSnap very close to the camera. Like all IR remote controls, very bright light can interfere with reception. Check that the BatSnap is pointing directly at the IR receiver on the camera. Check that the BatSnap isn't too far away. Check that the camera is keeping up! Some cameras like to go to sleep at inopportune moments, or take a while to write to memory cards. Most cameras run out of batteries at inopportune moments too. The camera doesn't take a picture straightaway, there's a delay. Check that the camera isn't set to 'remote with delay'. Check that the camera isn't trying to focus before taking the picture. Check that the camera hasn't fallen asleep between shots. 29th Sep 2011 Canon 400D and Pentax istDS now proven.